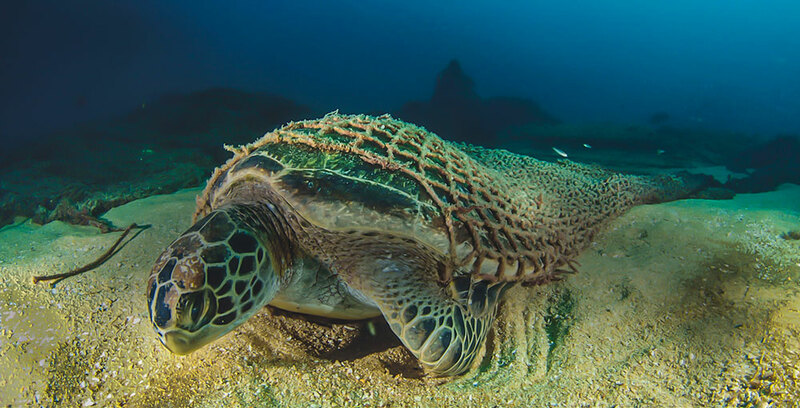 Here’s a depressing facts for you: World Animal Protection estimates 640,000 tonnes of fishing nets and gear are abandoned or lost at sea every year. To put that into perspective, that’s a pile of fishing nets that ways more than the Titanic added to our oceans every single year! Wake up call! These Ghost Nets, as they’re called, float around in the ocean doing what they do best: fishing. Only, no one comes to take the fish. The fish die for no good reason and are left to rot. Sharks, dolphins and other marine predators are attracted by the smell of lunch, get stuck and die as well. No to mention the countless animals, such as whales and turtles that get stuck by nets in their path. Ghost Nets are at the top of ocean killers, threatening many delicate marine species. Thankfully, there’s a group of smashingly awesome super human that are fighting for the ocean by taking a load off this destructive burden she struggles with. Healthy Seas sends divers into our oceans to retrieve Ghost Nets. They then hand the nets over to companies such as Aquafil and it’s initiative ECONYL. And they turn it into something that can put a smile back onto faces after reading those depressing facts: gear. Vaude is nailing it on all kinds of fronts. After already renouncing harmful PFC’s from their line, they are introducing up-cycled fishing nets to their eco-friendly materials and resources. The thermal hybrid Scopi Jacket‘s (pictured above) jersey material is made of 78% recycled polyamide. And while you’re over on their online shop make sure to look for the Green Shape icon for a guarantee of sustainable gear, fishing nets or not. I’m always excited to see big brands give eco-conscious to their masses of clients. So it’s awesome to see Volcom teaming up with ECONYL to make some very cute and very affordable active swimwear. The Simply Solid (also available here in Australia) line is made of 78% ECONYl yarn at such a high quality it’s still 100% recyclable once it’s too worn to wear. Don’t feel left out guys, Kelly Slater’s Outerknown teamed up with ECONYL to put together a line of boardies and outdoor lifestyle wear (think isulated jackets and shirts) made of recycled Ghost Nets and other waste. What’s your favorite eco-friendly piece of gear or brand? Let us know in the comments below!